A soothing and moisturizing mask formulated with the natural moisturizing ingredient, Sodium PCA that helps supply moisture to your skin. It also contains Hyaluronic Acid which has intense hydration and moisture retention capabilities. Lastly, Camelia Oil is present to lock the moisture into your skin and helps to soothe your skin. A brightening mask that contains Arbutin and Niacinamide, a water soluble vitamin that has anti-ageing effects that improves and lightens your skin tone. It also contains Citrus Unshiu Pericarp extract that has excellent anti-oxidant effects and Green Tea extract which contains Vitamin C, Tocopherols and Polypenols that brighten your skin! 1. After cleansing, carefully remove the thinner protective film to expose the *smooth surface. 2. Apply the smooth side of the mask to your face. 3. 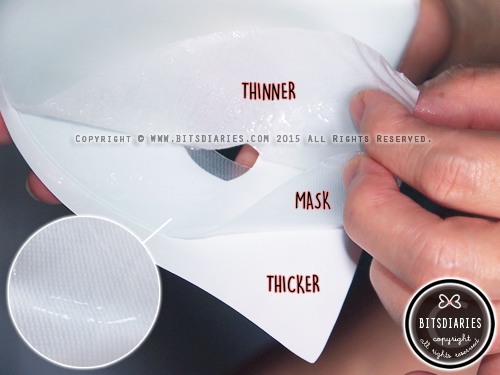 Remove the thicker protective film and adjust mask to fit the curves of your face. 4. After 30 minutes, remove the mask and discard. Gently pat your face with fingertips to help skin absorb the remaining essence. *Note: The mask has a smooth surface and a textured surface. Applying the textured side on the face may cause discomfort. Let's start from my first impression on the hydrogel mask. 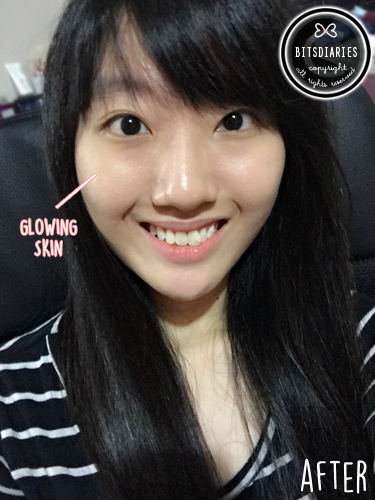 Faith in Face’s hydrogel masks are thicker and feel like jelly. Unlike regular microfiber and cotton sheet masks, Faith in Face's hydrogel masks contain a higher percentage of water soluble ingredients to deliver maximal hydration and superior skin rejuvenation. Each mask is saturated with essence and is very slimy — it would slip and slide on my face during application. Therefore, I have to keep adjusting to prevent it from falling off, which is something I dislike about because it tends to *tear easily. Hence, I suggest to lie down when you put on the mask. 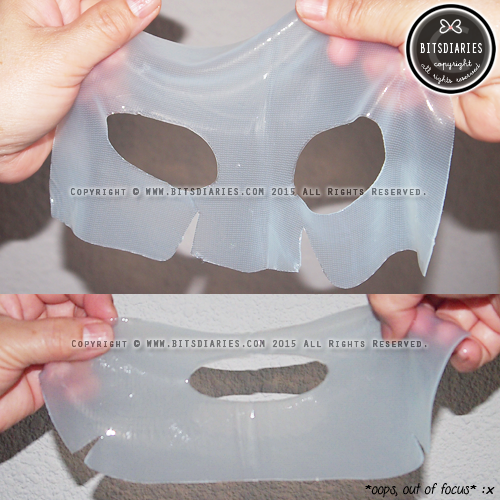 *Fun Fact: Hydrogel masks are reasonably fragile, and can tear easily. Upon putting on this mask, I can feel a cooling and refreshing effect on my face. It does soothe my skin and supply long-lasting moisture, leaving it supple and dewy! I love how soft and smooth my face feels after using the mask!! I am thoroughly impressed by this mask! You gotta try this if you are looking for a boost in hydration! Similar to After Shower Look Hydrogel Mask, this mask also gives a cooling and refreshing effect on my face upon application. I can also feel it leaves my skin hydrated and rejuvenated after application. 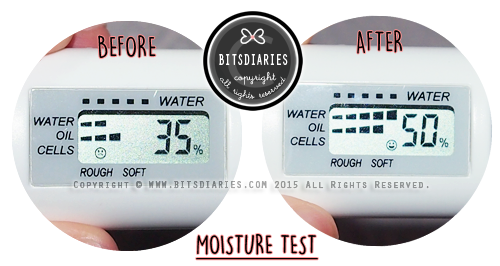 But I did a moisture test and found out that it doesn't provide as much hydration as After Shower Look Hydrogel Mask. However, it does provide immediate brightening effect! 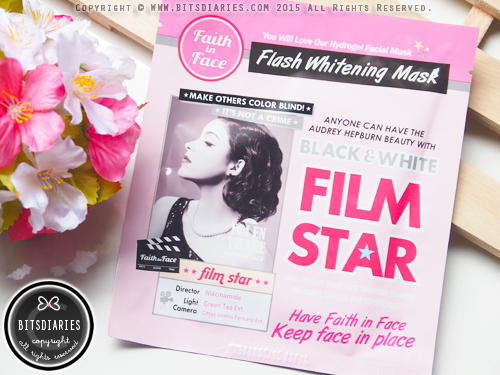 I noticed my skin complexion looked more radiant and even-toned after using this mask. Furthermore, I noticed my dark circles have lightened up too, but they are not completely gone. The only downside is that the brightening effect doesn't last until the next morning..., but it does a great job in delivering hydration and nourishment to the skin. 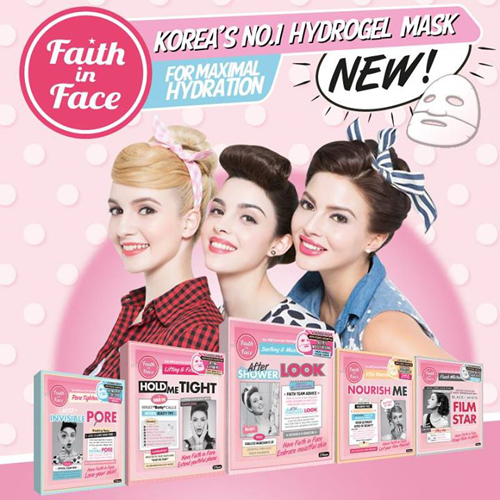 Overall, Faith in Face Hydrogel Masks provide skin with long-lasting hydration, instant soothing and brightening effects; not to mention, they have a gentle formula that is suitable for sensitive skin. I highly recommend to give their masks a try! The special formulation of Ceramide 3 with Broccoli Extract and Olive Oil provides the ultimate nourishment for your skin. Ceramide 3 plays an important role in generating a protective layer for your skin and is one of the most important lipid composition of stratum corneum. Broccoli Extract contains Vitamins C, E & beta carotene which promotes maintenance of healthy skin and prevents UV damage while Olive Oil moisturizes and strengthens your skin. A lifting and firming mask which provides dual care to maintain and improve the elasticity of your skin in the long term. Containing Copper Tripeptide that helps to liven and firm the skin without irritation, Rooibos extract and the popular Korean ingredient, Red Ginseng extract, that is known to reduce stress and improve firmness to the skin. HOLD ME TIGHT not only recovers and strengthens the firmness of your skin but also makes your skin look younger! 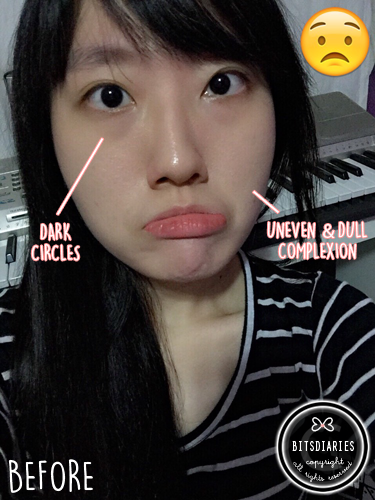 A pore tightening mask, MISS INVISIBLE PORE has a 3-step solution for your pores. Firstly, it contains Salicylic Acid to reduce sebums hidden in the pores. Secondly, Peppermint extract cleanses and purify your pores and finally, natural astringents such as Chestnut Shell extract and Witch Hazel extract help to tighten and close your pores. 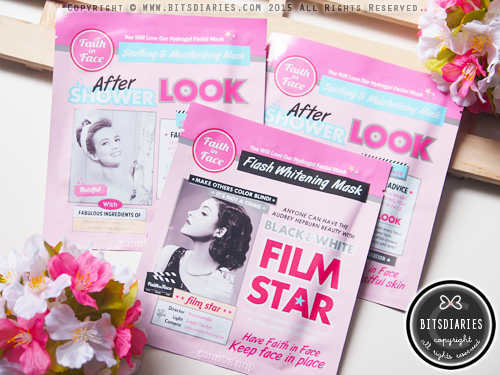 With these, you can now embrace your pores and enjoy crystal clear skin! 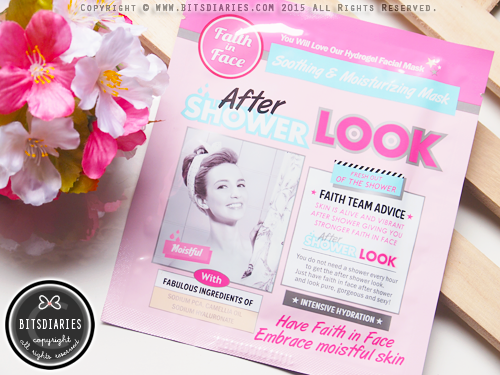 All five variants of Faith in Face Hydrogel Mask are now exclusively available at Watsons at the price of SGD$14.50 for a box of 3 sheets.